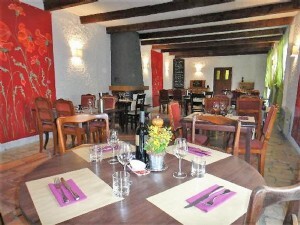 Located at the outskirts of the town, historic south-facing stone 17th century Chateau offering main residence, gites, 4 apartments, B&B, restaurant, snackbar, art gallery and winery set around a central courtyard reached via a stone archway, on 19365 m² of land with four hundred years old cedars, lawned gardens, seating area, courtyard with pond, campsite, outbuildings, large parking and pool. 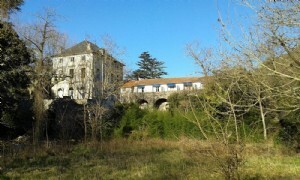 Beautiful and unique place, ideal for wellness or personal development courses. 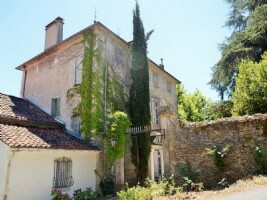 Touristic town with all shops and amenities at 45 minutes from Béziers. 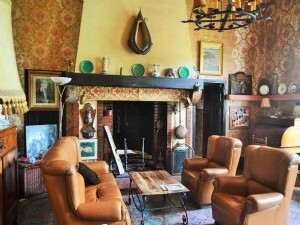 Located at the outskirts of the town, with access over its private bridge, unique historic south-facing stone 17th century Chateau offering main residence, gites, 4 apartments, B&B, restaurant, snackbar, art gallery and winery set around a central courtyard reached via a stone archway, on 19365 m² of land with four hundred years old cedars, lawned gardens, seating area, courtyard with pond, campsite, outbuildings, large parking and pool. 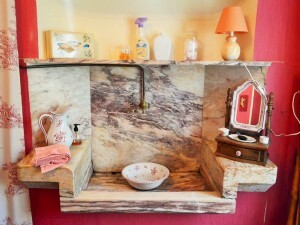 Partly renovated retaining its historical charm (wooden wine cuves, quartz stairs, hand painted murals, original doors and flooring, marble bathroom features, open fire places, ...). 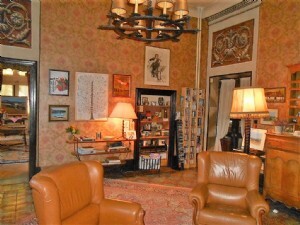 Possible to negotiate the furniture. Proven revenue. 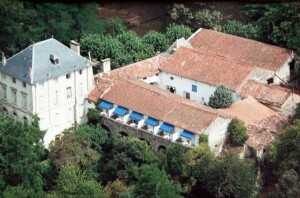 Beautiful and unique place, ideal for wellness or personal development courses. 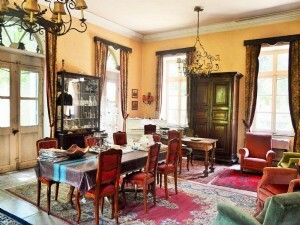 Ground = Entrance of 20 m² + lounge of 57 m² (double panel doors, original dining room of the Chateau, hand-carved mahogany fireplace, original tiles and features, dual aspect windows, access to south facing terrace, ceilings 3m80) + library of 37 m² (large fireplace, hand painted wall murals, double panel doors, ceilings 3m80) + kitchen of 24 m² + utility room + food larder + 2 WC + side entrance of 16 m² + cloakroom (ceilings 2m50) + vaulted cellar of 100 m² (access via Chateau or gardens), part of the wine cellar is dug in the rocks (keeping a constant temperature and hygrometry), containing wines dating from 1933 to date (all available for negotiation, the original carte du vin from the Chateau is available for inspection and retention with the wine cellar). 1st = Landing of 5.04 m² + dressing of 2.90 m² + library of 12.83 m² + entrance of 1.51 m² + bathroom of 2.6 m² (elevated bath) + WC of 2.46 m² + bedroom of 15.20 m² + wet room of 1.59 m² (WC, basin, storage) + bedroom of 23.25 m² (fireplace) + dressing room of 4 m² + bathroom of 5.65 m² + bedroom + office of 8.9 m² + music room of 14.50 m² + ceilings 3m65. 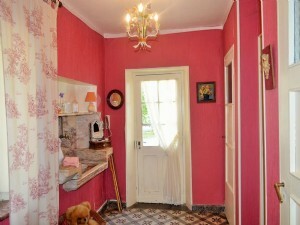 2nd = Landing of 4.25 m² + entrance of 3.30 m² + bedroom of 14 m² + bathroom of 3.83 m² (WC, bidet, basin, bath, marble sills, fireplace) + corridor of 3.75 m² + entrance of 2.16 m² + bedroom of 21.60 m² + bathroom of 3.82 m² (WC, bidet, basin, bath) + bedroom of 6 m² + bedroom of 8.7 m² + wet room of 1.6 m² (WC, basin, bidet) + lobby of 3.8 m² + bedroom of 12 m² + wet room of 3.20 (WC, basin, bidet) + ceilings 2m30 to 2m60, vaulted doors. Outside = 4447 m² private planted south-facing garden with shaded terrace of 375 m² + stone-flagged terrace of 20 m² + pool (5,5x9m, secured) with pool house and sunny and shaded areas + shower steps to large vegetable gardens + leads direct to river + private front courtyard accessed by arched stone filial + about 1,5 ha wooded and lawned area, barbecue and picnic area + own private bridge over river + camping area (is limited and situated to the side of the Chateau, beside the river) + about 30 parking places + pergola + well + the farm buildings may accommodate horses. 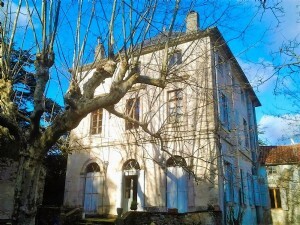 2 Apartments to renovate = 2 four-roomed apartments (accessed from the chateau or the courtyard) to renovate entirely (water and electricity on site). 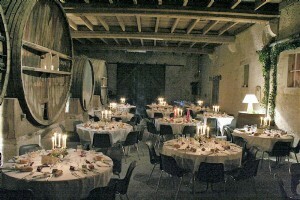 Courtyard = Original farm barns and outbuildings offering 1200 m² over two levels transformed into B&B, gîtes, restaurant, bar and art gallery set around a central courtyard reached via stone archways (shaded summer terrace of 66 m² under archways) with pond and water fountain. Ground = Lounge/bar of 43 m² (exposed beams, stone flooring) + dining room of 55 m² (fireplaces, exposed beams) + kitchen of 46 m² (fully fitted professional kitchen plus miscellaneous storage rooms + toilets of 28 m² + upper terraces of 100 m² (original barbecue/outside ovens) + permission granted (unused) to redevelop the terraces and outbuildings to enlarge + art gallery of 30 m² + 2 large store rooms + entrance of 36 m² to restaurant and to 2 apartments (which are on 1st floor). 1st = Entrance/library of 10.32 m² + apartment (entrance of 3.17 m², bedroom of 10.15 m², kitchen/dining room of 13.74 m² (fridge, sink, hob), bathroom of 2.8 m² (WC, basin, shower), terrace of 8.76 m², terrace of 8.27 m²) + apartment (bedroom of 13.24 m², lounge, kitchen/dining room (fridge, sink, hob), WC, bathroom of 4.01 m² (toilet, basin, shower), terrace of 7.46 m² ) + studio (bedroom of 14.37 m², lobby of 3.48 m², bathroom of 4.01 m² (bath, basin, WC, bidet), terrace of 7.95 m²) + studio (bedroom of 13.97 m², bathroom of 4.3 m² (bath, basin, WC, bidet), terrace of 6.98 m²) + studio (bedroom of 13.63 m², entrance of 3.39 m², bathroom of 4.01 m² (bath, basin, WC, bidet), terrace of 6.61 m²) + studio (bedroom of 13.02 m², entrance of 3.19 m², bathroom of 6.02 m² (bath, basin, WC, bidet), terrace of 6.9 m²) + gite (family bedroom of 24.87 m² with fireplace, bathroom (WC, shower, basin)). 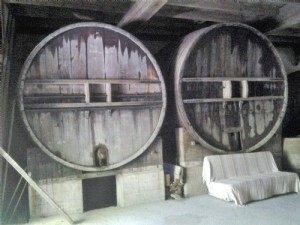 Winery = Original wine-making building of 200 m² over two levels with four original wooden wine vats of 180 hl, 225 hl, 90hl & 90 hl – used as a restaurant seating area and reception space + additional storage room of 36 m². Outbuildings = Original linen room of the chateau + workrooms + outhouses and multiple smaller buildings + permit to construct and renovate granted to current owners. Cottage to renovate = on the bank of the river stands the former coop to be completely refurbed ( stone structure retaining original features). 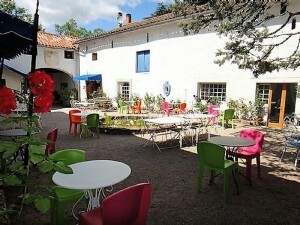 Snack-bar = the chateau is located close to a mini-golf, a swimming pool and camping and also the local rivers. 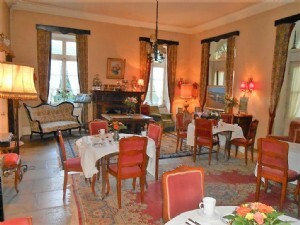 A snack-bar, with seating, is run in the grounds of the chateau, unseen from the chateau nor the swimming pool, but accessed by a small path through the grounds. This may be rented locally to a franchisee (as the owners have done). Sundry = Historical traditional chateau with original features + furniture to negotiate + habitable immediately + annual property tax 5850 € (less if restaurant not commercialised) + wooden parquet flooring + fuel heating + south facing garden + pool + impregnable views + proven revenues + close to a river and local sport activities + close to shops but secluded + good structural state.